The fall sports season is one of the busiest on the Special Olympics Kentucky calendar and the time to sign up is now if you want to be involved in any of our fall sports offerings. Bowling is one of our most popular sports with more than 1,500 athletes and coaches taking part statewide. 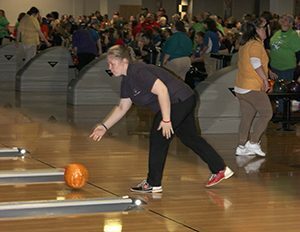 Bowling is by far the most popular Special Olympics Kentucky fall sports offering. More than 1,500 athletes and Unified partners take part in our bowling season each year statewide. Bowlers practice throughout August and September with Area Bowling Tournaments held throughout the state in October and early November. Athletes submit an eight-game average to compete in their local Area Tournament. Every bowler must compete in an Area Tournament to be eligible to bowl at the State Tournament, which will be held Dec. 1-2 in Louisville. For more information about the Special Olympics Kentucky bowling program, contact Amanda Wade at 502-695-8222 or awade@soky.org. Our flag football program continues to grow, with teams located in cities across the state. 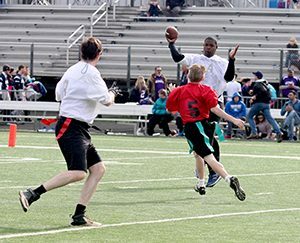 Flag Football remains one of the fastest growing sports offerings on the Special Olympics Kentucky calendar. Last year 300 athletes competed on 27 teams from across the state. Teams will begin practice soon to prepare for three Regional Tournaments that will take place in October. Every team has to compete in at least one Regional Tournament to qualify for the State Tournament, which will be held November 10 at Tates Creek High School in Lexington. For more information about the Special Olympics Kentucky flag football program, contact Hunter Brislin at 502-695-8222 or hbrislin@soky.org. The State Equestrian Competition kicked off the fall championship season on Sunday, Sept. 16. More than 60 Special Olympics athletes and their horse competed at Alltech Arena at the Kentucky Horse Park. For more information about the Special Olympics Kentucky equestrian program, contact Amanda Wade at 502-695-8222 or awade@soky.org. Like the equestrian program, the Special Olympics Kentucky State Artistic Gymnastics Competition is a one-day event, usually held in November in Lexington, KY. Gymnasts compete at one of four levels from beginner to expert in all the traditional gymnastics apparatus – floor exercise, vault, balance beam and uneven bars for women and floor exercise, rings, pommel horse, parallel bars and vault for men. Kentucky has long been a leader in Special Olympics gymnastics and our athletes have been incredible successful at World and USA Games events. Kentucky gymnasts were profiled on ESPN during the 2018 USA Games and gymnast Lee Dockins of Russellville is featured in a Special Olympics exhibit currently on display at the Smithsonian’s Museum of American History. Athletes train with local coaches to prepare for the State Competition. For more information about the Special Olympics Kentucky gymnastics program or for information about local gyms and coaches, contact Amanda Wade at 502-695-8222 or awade@soky.org.